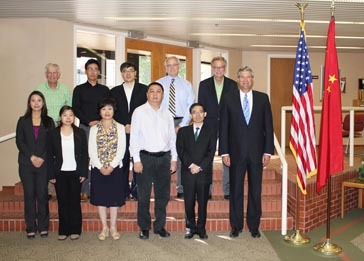 A delegation of Chinese value-added food importers and R&D specialists is visiting Northern Crops Institute today to meet with experts in cereal and pulse crops. The companies are exploring the possibility of using North Dakota food ingredi...ents in the processing of products such as instant noodles and flours to increase the nutritional value of the products. During their time in North Dakota, they have visited United Pulse Trading, JM Grain, North Dakota Mill and Red River Commodities, and they met one-on-one with ten North Dakota exporters. This reverse trade mission is part of the ongoing initiative to promote North Dakota’s healthy food ingredients throughout China and is hosted by the North Dakota Trade Office.